This blog was originally planned to release by end of this week. However we’re too excited to wait since the plan for 2017 is very interesting, we have to share with you ASAP. It’s quite a long list of many challenges. But with the current team, which has been strengthened last few months, we’re confident of the success. So let’s get started. - Front-End: we will set a new standard for design and layout where everything must follow strictly to make sure it all is consistency. All pages will be considered to have new appearances and the design will be mobile first. There will be an option for Admin to alter the layout whether a block is shown or not in the view of mobile - tablet. Many blocks would not be suitable to use on Mobile, wouldn’t it? - Back-End: a headache for the administrator, we totally understand this. Therefore, our major mission is to simplify these and bring the best way for you to manage the site. As an owner of a Social Network, you have many things to care about. So easily access to all settings with convenience layout, all pages will be re-organized for a natural flow. 2. Next is the list of enhancement suggestion for Core Features from you and our team, will be improved in 4.6.0. For your information, not every single request will be implemented, but suitable ones, the list will be detailed published in 4.6.0 Sneak Peak. 3. Core Apps Improvement: Video, E-gift, Page, Group, IM Chat, RSS Feed and more. Still, we leave the room for the 3rd party vendors to make advanced application, but the basic feature sets should be enough for basic need, ex. support FFMPEG in Video so you can encode in your own server. With new App System (*), it’s quite easy for the admin to install a new application and overwrite the basic one with advanced one if need be. We’ll set CKEditor as basic HTML editor which you can easily disable if needed. 5. Simplify HTML / CSS Structure: this is a good news for 3rd party developers when you can easily inherit and maintenance your code base and avoid unknown conflict. 1. Some of you will ask for Mobile Application. Whether it is in the 2017 Roadmap? Where is it in the Roadmap. Too much information to mention here, we must have a separated series to introduce this application. So, just stay tuned. 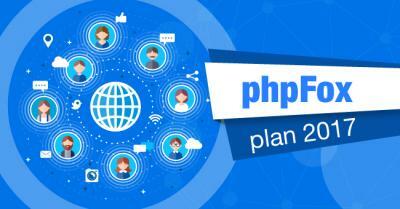 Recently, we have already added many features to prepare for better integrate among App Store, phpFox Core and AdminCP. It helps clients to purchase, manage purchased applications easily. It also helps 3rd party developers to manage app more easily. A new appearance of website phpFox.com is also being implemented, this work is totally separated with core script implementation, so you will properly see this in next few months. It’s subscription, where we will take care everything for you. No more headache about server issue. More information will be provided soon. Hopefully, with this given information, you will have the visual about what phpFox is doing for 2017.